"I’ve been involved in sport from a young age and knew that a desk job wasn’t something that would interest me." I’ve always played and been involved in sport from a young age and knew that a desk job wasn’t something that would interest me, so when I finished college I went and completed my level 2 in fitness and it started from there. 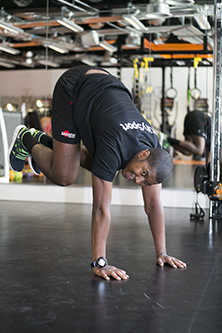 I specialise in body weight and functional based exercise. I work out between 3 and 5 times a week depending on what I can fit in my sessions. I stay motivated by keeping the momentum going. When you take a break from working out it’s hard to get back into it, which is why I always stay on. My favourite training session is back because I never need a spot when I exercise and I can go quite heavy. It’s enjoyable.